The Florida Department of Health in Seminole County provides children, families, men and women with quality, professional specialty care services. With special attention to preventative care and education, we assist with promoting the long-term health of our community and working together to ensure everyone has access to quality healthcare. Along with core public health services we provide clinical services according to the needs of the community. View or download our Programs and Services brochure. Please note our clinic only provides school physicals required for school entry. For sports physicals please check with local providers, urgent care facility or federally qualified health center such as True Health. For more information on School Entry Health Examination visit http://www.floridahealth.gov/programs-and-services/childrens-health/school-health/enrollment.html. For all Clinical Services please call 407-665-3700 to make an appointment. Same day appointments are honored as schedule permits. Immunizations are on a walk-in basis until August 18 to accommodate back-to-school needs. 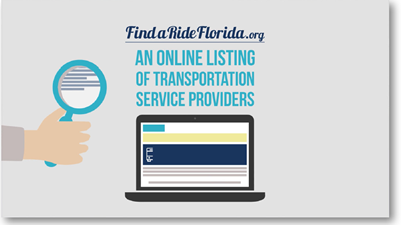 FindaRideFlorida.org is an online listing of transportation service providers in all of Florida's 67 counties. Visit FindaRideFlorida.org to see which transportation options can get you where you need to go.